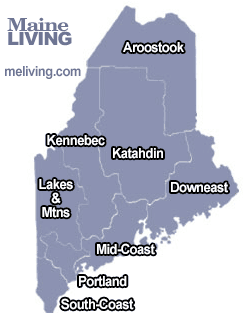 Aroostook County, Maine Inns & Yoga Retreats – Another great reason to visit Maine. Aroostook County, Maine has a fabulous selection of Inns, and Bed and Breakfast Inns to accommodate every budget and lifestyle. Ask us about Maine Yoga Retreats or share your Aroostook Northern Maine Inn comments. Thanks for mentioning to the innkeeper(s) you found them online in meliving.com – Maine’s Internet Magazine. Browse all of our suggested Maine Inns below. To feature your Maine Bed & Breakfast Inn, contact us. The Sewall House Yoga Retreat remains in the family and to this day continues the hospitality begun by Levi Sewall (who settled Island Falls and is William's father). Donna Davidge, the fifth generation in the house, runs the lovely old place as a yoga retreat, splitting her time between Island Falls and New York City. Aroostook Maine Inns - Maine BB Inns. The great wilderness of northern Maine is called Aroostook county. Find Aroostook Maine area Bed and Breakfast Inns. Enjoy the beauty of Aroostook Maine. Find discount lodging deals at the best Maine hotels, inns and resorts. Book online, compare rates, read TripAdvisor reviews.